1) Take a hard look at your prices. Pricing products is one of the most difficult things that any business owner has to do. At it’s simplest, you try to calculate prices that will cover your costs and earn enough of a profit to make it worth staying in business. But, what if you’re leaving money on the table by pricing your items too low? Or, vice versa, what if your menu is priced too high and your losing sales volume? Either scenario could effect profitability in a major way. Developing an optimal pricing strategy is 1/2 art and 1/2 science – entire books have been written on the subject, so it is too complex to cover in detail here. What it boils down to, however, is matching your prices to the value that your customers perceive in your items. If customers perceive that your $12.99 burger with locally raised, grass fed ground chuck represents an appropriate value, they’ll be happy to pay it – regardless of what it costs to make. So, how can you gauge your customers’ perceptions of value and price accordingly? Start with your direct competition. Are they pricing the same burger for $8? If so, then, all other things being equal, they’re probably stealing some of your sales. On the other hand, if they’re pricing it at $15, then there may be an opportunity for you to raise your price a little and increase your profitability. Do you have items on your menu that just don’t sell? Does your menu have so many items on it that you have to use a small, hard to read font in order to fit it all in? If you answered yes to either of these questions, consider ridding your menu of the clutter. Of course you want to keep your classics, customer favorites, and high profit items, but it may just be time to get rid of the rest. Too much on your menu will overwhelm your customers, create a large amount of inventory that you will end up throwing away, and leave you with increased labor costs, all of which reduces profitability. To combat the clutter, consider recommendations made by O’Dell Restaurant Consulting, a company that offers restaurant consulting services. They recommend taking your sales mix report and eliminating the bottom half of the items; the ones that aren’t selling. Then, take the top half and really evaluate where in your kitchen these items are prepared, using that to organize and balance your menu. For example, have a grilled items section, sautéed selections, fried foods, etc. O’Dell suggests no more than 20 main course dishes, including sandwiches, 4-6 starters, and 2-3 salads. If you have pizza on your menu, it is suggested to make up 2/3 of your main course selections and you should only offer it in a maximum of 3 sizes. You should still accommodate special requests but have a special price for those requests. Cleaning up your menu and getting rid of the clutter will give your customers better food and better service in addition to allowing your restaurant to serve more people. 3) Try a new design. A fresh perspective and a new look to your menu is a great way to upgrade your brand and improve profitability. Consider investing in the services of a graphic designer or a marketing professional who can use their tricks of the trade to make your menu more attractive and eye catching. Or, look into online companies who offer professional templates, like Vistaprint, to complete this task on your own. Regardless of who does it, design does make a difference. It’s all about the text font and size, the illustrations and images, colors used, and even the shape, thickness, and texture of your menu. It’s also about making sure that your final menu fits in with the concept and atmosphere of your restaurant. 4) Change up your descriptions. The way you describe your menu items makes a difference. Keep your menu descriptions short but offer descriptive terms that highlight their taste, uniqueness, or ingredients. The tastier it sounds, the more interest there will be in ordering it. If this isn’t your forte, consider hiring a professional copywriter or marketer to assist you with this task. You can find freelance professionals who do this type of work at www.upwork.com. 5) Consider item placement and positioning. When organizing your menu, here are a few fun facts that may be helpful to increase sales…According to SoftCafe, a developer of menu software for restaurants, customers often remember and order the first two items and the last two items in each category on your menu. On a tri-panel menu, people look at the center panel first and move their attention counter clockwise. Place your highest margin items in these areas, and you could see a substantial increase in profitability. 6) Add fresh into the mix. Food trends have moved into organic, fresh, and healthier options. Offering “fresh” items on your menu not only sounds attractive to your customers, but can also be a selling point for your restaurant. Supporting the local economy and having healthier options for your customers is good for the environment, good for the local economy, and can make you stand out from other restaurants. In addition, customers are willing to pay a little more for ingredients that are fresh, local, and healthy with an even better taste. Customers will come to your restaurant not only looking for deals, but also for menu items that they can’t get anywhere else. Consider a specials menu or insert with your regular menu that you change out every so often to push high margin items. A great example of a company that utilizes this strategy is Red Lobster, which has different, short lived, specials like Shrimp Fest, Crab Fest, and Lobster Fest at various times of year. Play up seasonal offerings during the holidays or offer certain items related to commercialized events like the Super Bowl or the premier of a popular television show in your area. Specials keep your menu interesting and they can even allow you to use up inventory that might otherwise go to waste. When possible, try to include photos that offer your customers a visual presentation of your food. Some people are visual decision makers; they will see an item and order it because the picture intrigued them. Consider highlighting your popular menu items, a new or featured item, or even something that is a long time classic. With these photos, be sure the images are sharp ones with a professional look. But, don’t go overboard. Too many images can be overwhelming and can look chaotic. Plus, it’s okay to have white space; it gives your customer’s eyes a chance to rest. Applebee’s does a great job of using photos on their menu to entice their customers. 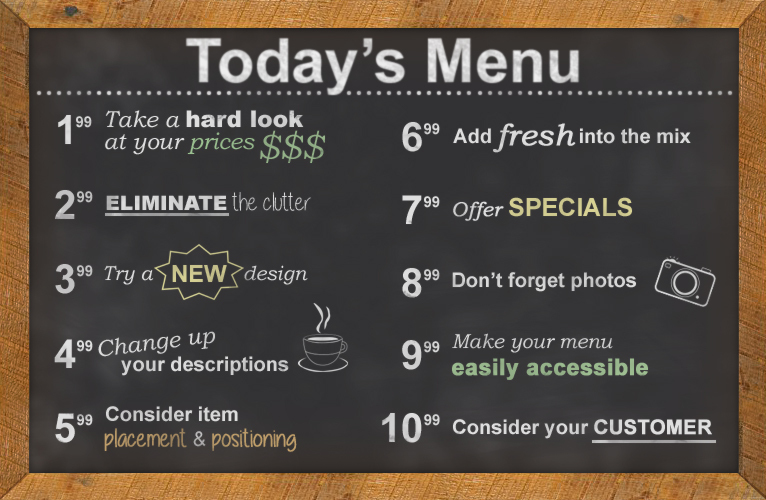 9) Make your menu easily accessible. In this day and age, people want information in an instant and make their decisions based on the information available to them. Included in this is your restaurant’s menu. Your goal is to get that information to your customers as soon as possible. Yes, you can make sure that your menu is on the table when each customer is seated or that the hostess hands each patron a copy of it when they first sit down. You can even offer a menu on the wall in the waiting area for your customers to read. But, one of the best ways to offer your menu even before any customer walks in is online through a mobile friendly website, app, or on any of the social media sites. When customers can access your menu from anywhere, it may just be the deciding factor that pulls their cars into your parking lot. And when paired with the recommendations above, you’ll be sure to see the profits of your efforts. Who is your customer and what would appeal to them? When your restaurant menu appeals to each customer, especially the news ones, they’ll surely return for more. For example, if your business caters to families, offer a separate kids menu. If your restaurant is located in a college town, offer pricing that appeals to the average college student. Or, if you have an upscale restaurant, offer a menu that caters to your customer in both variety on your menu and in design.